LAR Feed Carts are designed to store and transport animal feed. 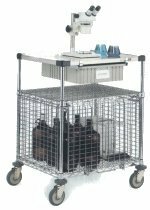 Stainless steel finish provides superior corrosion resistance, while compact footprint makes it easy to maneuver in and around tight lab spaces. Clear totes provide easy identification of tote contents. The light duty feed cart comes standard with one clear 12" deep Olympic tote, which is perfect for holding all types of animal feed, clear snap-on cover, and wire cover holder accessory that easily mounts on top shelf. 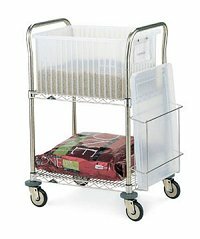 The 18" x 24" cart can hold up to 375 lbs, with two wire shelves (top and bottom). One tote capacity/shelf 4" (102mm) resilient casters. This cart comes standard with 5" poly casters and can hold up to 600 lbs! It is 24" x 26", including two clear totes, which are perfect for holding all types of animal feed, two snap-on covers, two stainless handles, and one cover holder. Provides secure storage for animal cage, lab instrument, or hazardous chemical transport. Solid stainless steel shelf with raised ship’s edge can be used as a work surface and can contain unwanted spills. 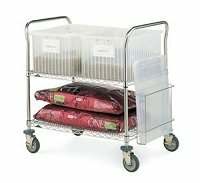 Cart features two stainless steel wire shelves, one stainless steel security module, and one stainless steel solid shelf. Cart comes standard with two brake casters and two swivel casters. 24" x 30"
Durable, clear totes provide clean and secure storage for animal feed. Totes are injection-molded from clear, polypropylene material, are stackable, and can be combined with clear snap-on covers and cardholders for security and identification of contents. 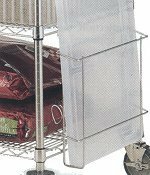 Stainless steel wire cover holder provides a convenient storage option for tote box covers when not in use. Accessory easily mounts on any Super Erecta® based wire shelf.